All Bookings are confirmed only after booking form and paperwork are signed and returned and all relevant deposits are paid. Wadsley House Social Club reserves the right to cancel your function if payment conditions are not upheld. Receipt of your booking deposit confirms your acceptance of all terms and details. Provisional bookings are held for 3 days only, before a deposit is required to secure your booking. After 3 days we reserve the right to release the booking. Deposits are non-refundable or transferable. In the event of cancellation we regret that pre payments and deposits will not be refunded under any circumstances. Cancellations must be sent in writing or an extra cost may be incurred. All monies due are to be paid 21 days prior to the date of the function. Special dietary requirements need to be arranged at least four weeks prior to the Event. All of our food is subject to strict guidelines for delivery, food storage and subsequent food quality and hygiene. We cannot take responsibility for food that has been brought onto Wadsley House Social Club premises by the Hirer or guests. No outside alcohol can be brought onto or consumed on our licensed premises. No exceptions of any kind are made in this regard. Anyone found consuming his or her own alcohol on the premises would be ejected. With prior notice we are able to arrange for you to supply your own wine with a corkage charge of £5.00 (inc vat) per bottle. Wadsley House Social Club reserves the right to alter pricing without prior notification. Wadsley House Social Club reserves the right to bill any items missed from the first bill or any extra costs incurred at a later date. Events can only be paid via Cash or Cheque (Cheques can only be accepted to the value of the Cheque guarantee card). The Hirer is responsible for the behaviour and actions of their guests while at Wadsley House Social Club. Inappropriate behaviour may result in your event being stopped early or cancelled. The management reserves the right to refuse admission and to remove from the premises any person whose conduct is considered to be unacceptable in their opinion and if the behaviour is causing offence or upset to other guests. The Hirer shall pay for any loss or damage to any part of the club premises, or to any fixtures, fittings and equipment, which are caused by the Hirer or their guests. We will not be held responsible for any loss or damage to any article brought onto the premises. Guests are reminded that a responsible adult must supervise children at all times. Stairs and walkways can be slippery and pavements can be uneven due to the age of the property, extra caution is advised when walking in the car park. Whilst we encourage guests to enjoy the garden, please note that care must be taken. Walking on the bowling green is strictly prohibited. Vehicles are parked on club premises at the owners’ risk. The management cannot be held responsible for any loss or damage to any motor vehicles or any other property placed in it. 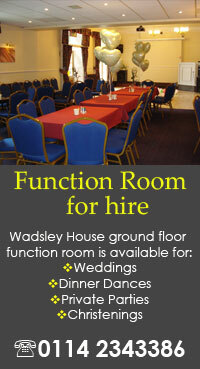 Wadsley House Social Club is situated in a residential area, all guests are asked to leave the premises quietly. We cannot accept responsibility for outside contractors and service providers. In all cases English Law prevails. We have a 14-day lost and found policy, which means we can only keep an item found for that amount of time. It is the guests responsibility to check they have all personal belongings before departure of the premises. We may take the opportunity to update our terms from time to time; it is the customer’s responsibility to check any updates or at any time an updated terms and conditions can be obtained through our reception team.